A blood pressure reading below 140/90 mm Hg should be the minimum goal for most people. People with certain health conditions (diabetes) may benefit from a lower target goal. Goals for various populations are constantly being revised as new information is gained from research studies. Your provider can help give you the most appropriate goal. 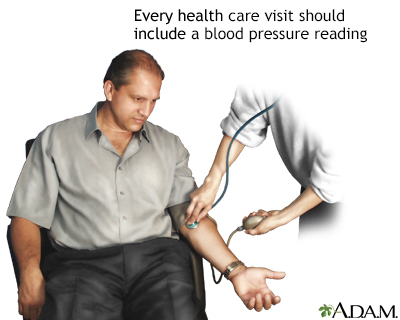 Most people with high blood pressure will benefit from monitoring their blood pressure at home on a regular basis. Home monitoring can help show if blood pressure medications are working or if they need to be adjusted. Drug treatment for high blood pressure is tailored to the individual. There are many different types of blood pressure medications. Although some people need only one drug to control blood pressure, many patients require at least two medications. The heart pumps blood with excessive force. The body's smaller blood vessels (known as the arterioles) narrow so that blood flow exerts more pressure against the vessels' walls. High blood pressure makes the body's heart work harder, which over time can lead to damage to blood vessels throughout the body. Damaged blood vessels affect function in the heart, kidneys, brain, and eyes. Systolic blood pressure (the first and higher number) is the force that blood exerts on the artery walls as the heart contracts to pump out the blood. It shows the pressure in the arteries when the heart is beating. Diastolic blood pressure (the second and lower number) is the measurement of force as the heart relaxes to allow the blood to flow into the heart. It shows the pressure in the arteries when the heart is resting between heartbeats. Primary hypertension, also called essential or idiopathic hypertension, is high blood pressure without a known cause. About 90% of all high blood pressure cases are this type. Secondary hypertension is high blood pressure caused by an underlying medical condition, such as kidney or endocrine disorders. It accounts for about 5% of high blood pressure cases. Isolated systolic hypertension occurs when systolic pressure is high (over 139 mm Hg) but diastolic pressure is normal (under 90 mm Hg). It is related to arteriosclerosis (hardening of the arteries). Isolated systolic hypertension is the most common form of hypertension in people older than age 50. Diastolic hypertension refers to an elevated diastolic blood pressure reading (over 89 mm Hg). This subtype is most common in people age 30 to 50. Prehypertension blood pressure (120 to 139 systolic or 80 to 89 diastolic) indicates an increased risk for developing high blood pressure. High blood pressure (hypertension) is greater than or equal to 140 mm Hg (systolic) or greater than or equal to 90 mm Hg (diastolic). Hypertension is further divided into stages 1 and 2 depending on severity. NOTE: If one of the measurements is in a higher category than the other, the higher measurement is usually used to determine the stage. For example, if systolic pressure is 165 (Stage 2) and diastolic is 92 (Stage 1), the person would still be diagnosed with Stage 2 hypertension. A high systolic pressure compared to a normal or low diastolic pressure should be a major focus of concern in most adults. For children, blood pressure readings are based on percentile ranges for a child's body size. Hypertension in children is defined as average systolic and diastolic readings that are greater than the 95th percentile for gender, age, and height on at least three occasions. Prehypertension in children is diagnosed when average systolic or diastolic blood pressure levels are at least in the 90th percentile, but less than the 95th percentile. For adolescents as with adults, blood pressure readings greater than 120/80 are considered prehypertensive. Increasing rates of childhood obesity have led to higher rates of hypertension and prehypertension among children and adolescents. However, according to the United States Preventive Services Task Force (USPSTF), it is not clear if blood pressure screening is helpful for children who DO NOT show signs or symptoms of hypertension. It is also not certain if screening accurately identifies children at risk for heart disease. The USPSTF recommends pediatricians make a decision to evaluate blood pressure based on specific clinical situations (for example, when a child is overweight). Hypertension is referred to as primary (essential) when the doctor is unable to identify a specific cause. It is by far the most common type of high blood pressure. Primary hypertension may be due to a combination of genetic, environmental, and other factors. Genes that regulate a group of hormones known collectively as the angiotensin-renin-aldosterone system. This system influences all aspects of blood pressure control, including blood vessel contraction, sodium and water balance, and cell development in the heart. Genes that cause abnormalities of the sympathetic nervous system. This is the part of the autonomic nervous system that controls heart rate, blood pressure, and the diameter of the blood vessels. Kidney disease is the most common cause of secondary hypertension, particularly in older people. In addition to diabetic nephropathy, many other types of kidney diseases can cause hypertension. Renal artery stenosis involves the narrowing of the renal artery and is usually caused by atherosclerosis. Other types of kidney disease associated with hypertension are polycystic kidney disease and renal parenchymal disease. In the United States, about 1 in 3 adults has high blood pressure. Many people with high blood pressure don't know they have it. About 30% of American adults have prehypertension (blood pressure ranges from 120 to 139/80 to 89 mm Hg). People who are diagnosed with prehypertension are at increased risk of developing high blood pressure. Chronic heavy alcohol use can increase blood pressure. Women may be more sensitive than men to the blood pressure effects of alcohol. 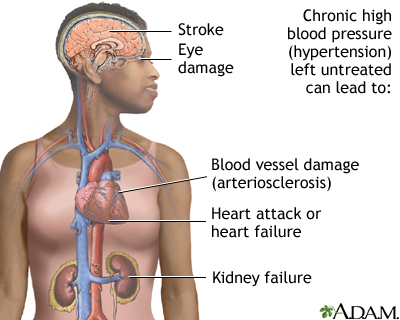 High blood pressure places stress on several organs (called target organs), including the kidneys, eyes, and heart. The stress causes them to deteriorate over time. Coronary artery disease (CAD). High blood pressure contributes to the thickening of the blood vessel walls, and worsen atherosclerosis (accumulated deposits of cholesterol in the blood vessels). The end result is called CAD, also called ischemic heart disease. Th presence of CAD increases the risk for angina (chest pain), heart attack, stroke, and death. High blood pressure is the most common risk factor for heart attack and stroke. Heart failure. High blood pressure increases the heart's workload. Over time, this can cause the heart muscle to thicken (cardiac hypertrophy), which makes it more difficult for the heart to pump out sufficient blood. This process can eventually lead to heart failure. Cardiac arrhythmias. High blood pressure increases the risk for cardiac arrhythmias (disturbances and irregularities in heartbeats). Arrhythmias include atrial fibrillation, premature ventricular contractions, and ventricular tachycardia. About two-thirds of people who suffer a first stroke have moderately elevated blood pressure (160/95 mm Hg or above). Hypertensive people have up to 10 times the normal risk of stroke, depending on the severity of the blood pressure in the presence of other risk factors. Hypertension is also an important cause of silent cerebral infarcts, which are blockages in the blood vessels in the brain (mini-strokes) that may predict major stroke or progress to dementia over time. The USPSTF recommends screening for type 2 diabetes in all people with blood pressure higher than 135/80 mm Hg. High blood pressure can injure the blood vessels in the eye's retina, causing a condition called retinopathy. Sexual dysfunction is more common and more severe in smokers and men with hypertension than it is in the general population. Although older drugs used to treat hypertension can be associated with erectile dysfunction as a side effect, the disease process that causes hypertension is itself a major cause of erectile dysfunction. Many women who are likely to develop hypertension when they are older have their first elevated blood pressure readings during pregnancy. Elevated blood pressure readings generally show up early in pregnancy, before 16 to 20 weeks. These women often require antihypertensive medications during pregnancy and closer monitoring of themselves and the fetus. Continued hypertension after the pregnancy is also not uncommon. Severe and sudden high blood pressure in pregnant women is one component of a condition called preeclampsia (also called toxemia) that can be very serious for both mother and child. Preeclampsia occurs in up to 10% of all pregnancies, usually in the third trimester of a first pregnancy, and resolves immediately after delivery. Other symptoms and signs of preeclampsia include protein in the urine, severe headaches, and swollen ankles. The reduced supply of blood to the placenta can cause low birth weight and eye or brain damage in the fetus. Severe cases of preeclampsia can cause kidney damage, convulsions (seizures), and coma in the mother and can be lethal to both mother and child. Women at risk for preeclampsia (particularly those with existing hypertension) are monitored carefully for its presence. Both mother and fetus are monitored closely after a diagnosis. Blood pressure medications may be required. Delivery is the main cure for preeclampsia. In severe cases, an obstetrician may need to induce pre-term birth. Malignant hypertension is very high blood pressure that comes on suddenly and quickly. 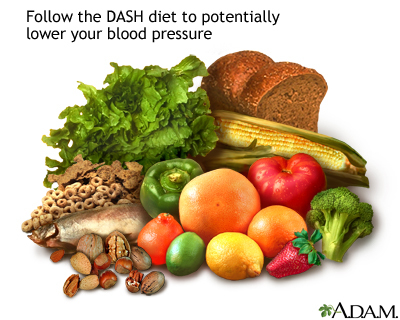 The lower (diastolic) blood pressure reading, which is normally around 80 mm Hg, is often above 130 mm Hg. This rare disorder affects about 1% of people with high blood pressure, including both children and adults. It is more common in younger adults, especially African American men. The standard instrument used to measure blood pressure is called a sphygmomanometer, more often referred to as a blood pressure cuff. Measurements are given as units of mercury, which was used to fill the central column in standard sphygmomanometers for many years. Modern devices DO NOT use mercury. These people may require additional blood pressure monitoring. Any symptom that might indicate secondary hypertension (high blood pressure caused by another disorder). Such symptoms include headache, heart palpitations, excessive sweating, muscle cramps or weakness, or excessive urination. General treatment goals for hypertension aim to reduce blood pressure to below 140/90. Specific blood pressure goals may differ depending on a patient's individual health profile and risk factors. Lifestyle changes are the first step for reducing blood pressure, and are an essential accompaniment to drug treatment. In some people, a single-drug regimen can control Stage 1 hypertension (systolic 140 to 159 or diastolic 90 to 99) if lifestyle changes (diet, exercise, weight control) are not enough. For people with Stage 2 hypertension (systolic above 160 or diastolic above 100), guidelines recommend two or more medications. A normal blood pressure is below 120/80. High blood pressure is above 140/90. Reducing high blood pressure is essential in prevention of stroke and other cardiovascular disease. This is called primary prevention. In general, most patients with hypertension who DO NOT have diabetes or cardiovascular disease should aim for blood pressure below 140/90 mm Hg. Blood pressure control is also very important for those with diabetes, since their risk of cardiovascular disease is so much higher than in the general population. In general, people with diabetes and hypertension should strive for blood pressure levels of less than 140/90 mm Hg (systolic/diastolic). The American Diabetes Association recommends a target goal of 140/80 mm Hg. For some people, especially younger people, a systolic blood pressure goal of less than 130 mm Hg may be appropriate. People with diabetes and high blood pressure need an individualized approach to drug treatment, based on their particular health profile. The most commonly used blood pressure targets for people with these medical problems are below 130 to 140/80 mm Hg. There is some evidence to suggest a targeted blood pressure of 120 systolic. Blood pressure treatment target goals for patients ages 60 years and older are a matter of debate. Blood pressure medications can increase the risk for falls and cause other side effects. At the same time, poorly controlled blood pressure can increase the risk for stroke and heart complications. The advantages and disadvantages of aggressively treating blood pressure need to be carefully considered for each individual patient. Many doctors are concerned about not treating patients whose blood pressure exceeds 140/90, and are following the stricter ACC/AHA recommendations. However, doctors do agree that medication side effects need to be considered, especially when treating elderly patients. Experts and major guidelines DO NOT entirely agree on a goal blood pressure for those with a history of cardiovascular disease or stroke. While some claim the evidence to support lowering blood pressure below 140/90 mm Hg is very weak, others recommend lowering systolic blood pressure ranges to anywhere from 125 to 135 mm Hg. Diuretics rid the body of extra water and salt. Thiazide diuretics are usually the first-line treatment for high blood pressure. Angiotensin converting enzyme inhibitors (ACEIs) reduce the production of angiotensin, a chemical that causes arteries to narrow. Angiotensin-receptor blockers (ARBs) block the action of angiotensin. Calcium-channel blockers (CCBs) widen blood vessels and some decrease the strength of the heart's contractions. Thiazide diuretics. These include chlorthalidone (Thalitone, Clorpres), chlorothiazide (Diuril), indapamide (Lozol), hydrochlorothiazide (HydroDIURIL), bendroflumethiazide (Naturetin), methyclothiazide, (Enduron), and metolazone (Zaroxolyn). All of these prescription drugs are available in generic form. In most cases, thiazides are preferred to other diuretics for treatment of high blood pressure. Some providers fell that chlorthalidone has the best evidence for its use. Potassium-sparing diuretics. These include amiloride (Midamor, generic), spironolactone (Aldactone, generic), and triamterene (Dyrenium, generic). Loop diuretics. Because loop diuretics act faster than other diuretics it is important to avoid dehydration and potassium loss. Loop diuretics include bumetanide (Bumex, generic), furosemide (Lasix, generic), ethacrynic acid (Edecrin, generic), and torsemide (Demadex, generic). Potassium-sparing drugs have their own risks, which include dangerously high levels of potassium in people with existing elevated levels of potassium or in those with damaged kidneys. However, all diuretics are generally more beneficial than harmful. ARBs, also known as angiotensin II receptor antagonists, are similar to ACE inhibitors in their ability to widen blood vessels and lower blood pressure. They may have fewer or less-severe side effects than ACE inhibitors, especially coughing, and are sometimes prescribed as an alternative to ACE inhibitors. In general they are prescribed to people who cannot tolerate or DO NOT respond to ACE inhibitors. Weber MA, Schiffrin EL, White WB, et al. Clinical practice guidelines for the management of hypertension in the community:a statement by the American Society of Hypertension and the International Society of Hypertension. J Clin Hypertens (Greenwich). 2014;16(1):14-26. PMID: 24341872 www.ncbi.nlm.nih.gov/pubmed/24341872.